I am delighted to be back! I certainly never went away, but my website went a dormant while this fantastic new one was being created. A huge thank you to Les Dundas Web Design Services for all the work he has put into creating this site. I am pleased that now viewers to this page will be kept up-to-date as it links to my Facebook business page Catherine Smyth Media and I promise I will be better at posting more regular blogs. 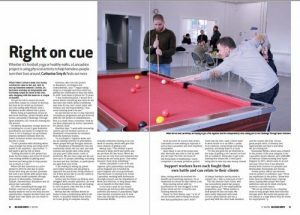 This week I am delighted to have a two-page feature in the Big Issue North all about a fantastic project Challenge Through Sport Initiative, part of Active Lancashire. This groundbreaking scheme is having amazing results across Lancashire. I am in the middle of writing news stories to promote the Hyndburn Business Awards, and the deadline for nominations is fast approaching – Tuesday April 16. If you want to nominate a business click the link above. This year I have interviewed the owner of an amazing luxury cat hotel – where the feline guests have their own ‘cat’ios – Rhoden Manor Cattery, a superbly creative company helping people living with dementia to rekindle their memories – My Colourful Memories and beautician Carla Chatburn whose salon Pure Perfection is sponsoring the first ever health and beauty award. The presentation evening is in June. I have just submitted the newspapers I create in three secondary schools for the national Shine School Media Awards, they are Fearns Chat (which won the best newspaper and best front cover in 2018), Coal Clough News and The Heights Free Press. Let’s hope one of my school papers is selected as a finalist this year. As well as my contracted work, I have also worked for more ad hoc clients than ever before and sourced a wider range of outlets for news including online trade websites and putting guests forward for radio interviews. If you have a story to tell – give me a bell.